People are always attracted to water. 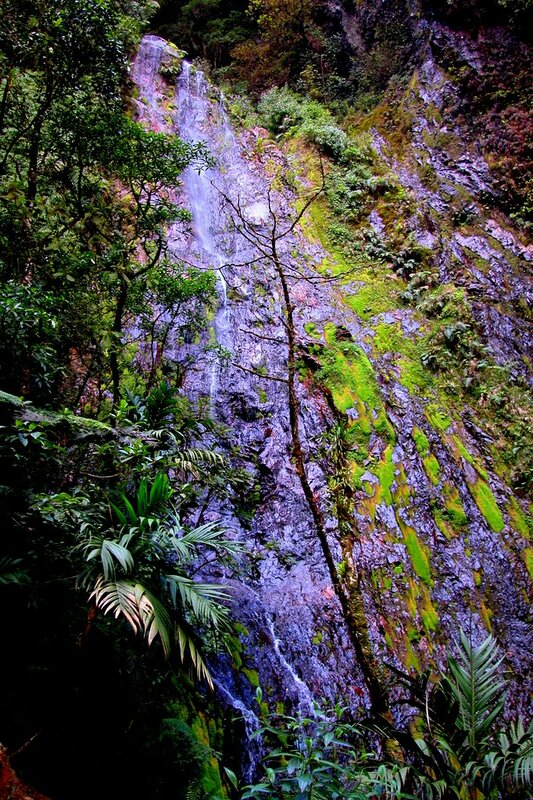 We hiked up the mountain to this cascade in Le Tigre National Park, Honduras. It’s early on a February morning in 2007, Tegucigalpa, Honduras, and already hot. I don’t mind. Back home in Kansas City it’s freezing. Behind the courtyard wall, I wait at the gate, listening. I’m an early riser so I volunteered to make the water bottle exchange. Most societies and religions find spiritual and cleansing properties in water, so Michael is right about that. Three large empty bottles sit on the driveway near the gate. I hear the faint call, and I lean out to look. I see a truck slowly rumbling down the steep incline of street in this affluent neighborhood in the capital city of Honduras. The back of the truck is stacked with large water bottles. Now we’ll have purified water for the next couple of days. We go through it quickly, using it for everything that passes our lips. The water truck comes three mornings a week. It saves the trouble of taking the bottles to the store. The house has running water, but it’s not purified. We have to be careful not to drink it or even use it for brushing our teeth. I keep a small bottle of purified water in the bathroom during my visit. You can’t be careful everywhere, and on a trip to see the Mayan ruins in Copan, Honduras, some of us come down with horrible gastrointestinal distress. I’ll spare you the details (worst diarrhea of my life! ), but it was touch and go on the drive home. Michael and Anita knew the roads and the rest stops, and thankfully, my husband is an Eagle Scout, prepared with supplies at all times, including a roll of toilet paper. 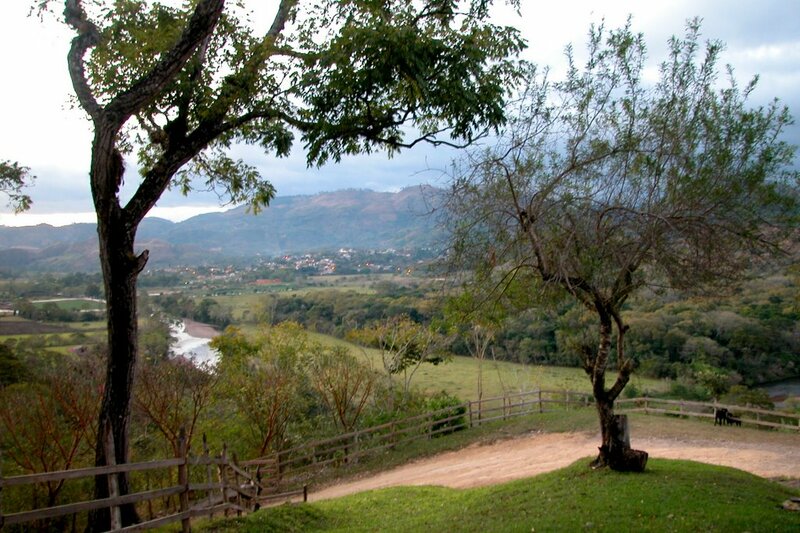 Hacienda San Lucas overlooks the Copan River Valley, where the early Mayans settled more than a thousand years ago. Maintaining pure water is always a problem wherever people gather in cities. In Copan, we visited Flavia Cueva, who owns the Hacienda San Lucas. Anita, who is with the U.S. State Department, had met with Flavia before on an official visit. Local people and members of the International Rotary were working to improve the water quality. International Rotary is providing water distribution and health education to six remote villages in the area. My water district at home, WaterOne, sends out an annual water quality report, summarizing what’s in the water and provides lots of facts, which are also available on the website. WaterOne was one of seven utilities worldwide selected as a finalist for a global water award for its Wolcott Treatment Plant. We’re very lucky we don’t need to buy bottled water, regularly, although there is a run on bottled water now because of the boil order. A raccoon appears be to the culprit in a water pipe rupture that led to a boil advisory for more than 400,000 water customers in Johnson County. Officials of Water District No. 1 found the animal dead inside an electrical unit at the Hansen treatment plant on Holiday Drive in Kansas City, Kan.
Eric Arner, a spokesman for WaterOne, said the animal may have chewed into wires or just brushed by the equipment, triggering an event that will affect customers at least until 5 p.m. Saturday during one of the hottest spells of the year so far. People in the WaterOne service area — which includes most of Johnson County but excludes most of Olathe — are advised to use bottled water or to boil their tap water at least two minutes before consuming it. Unboiled water is safe for washing and bathing. Retail stores in Johnson County are reporting brisk sales of bottled water. People are buying shopping baskets full of it at the Lenexa Sam’s Club, 12200 W. 95th St. The Price Chopper at 8686 Antioch Road in Overland Park was sold out by mid-afternoon. A new shipment was expected over the weekend but store management did not know when it would arrive. The boil precaution is necessary because the pipe rupture led to a drop in water pressure, which may have drawn contaminants into the system. Officials are testing tap samples from across the 275-square-mile water district for safety. That process, and flushing any contaminants out of the system, takes at least 18 hours. Arner said water officials noticed a sudden drop in system pressure at 7:20 a.m., which they later attributed to a raccoon that got inside the housing of one of the huge electrical switches that run the pumps. The animal apparently shorted out the switch. Officials believe that surge caused a 54-inch pipe near the Hansen plant to rupture at a joint. Arner said the pipe should not have failed even with a surge and WaterOne is investigating whether there were any other factors involved. Water officials were able to restore pressure throughout the system shortly after the pipe break but some areas may have less pressure than normal. While most of Olathe is outside WaterOne, between 6,000 and 7,000 people in northwestern and southwestern areas of the city are affected, said city spokesman Tim Danneberg. Every spring, my maternal grandmother made strawberry rhubarb pies and sauces. She grew the plants in her huge garden, and my cousins and I would also find it among the grass and weeds in the old abandoned garden plot, where rhubarb and asparagus plants were all that remained. The rhubarb plants seemed eternal to me then, although I’ve never had any luck keeping any alive in my own gardens. When I saw some rhubarb for sale at a country market, I bought about ten stalks. Rhubarb isn’t palatable without sugar, though, so I’ve added some no-calorie sugar substitute, which is also a no-no, but I’m not giving that up fake sugar entirely. What is life without rhubarb? 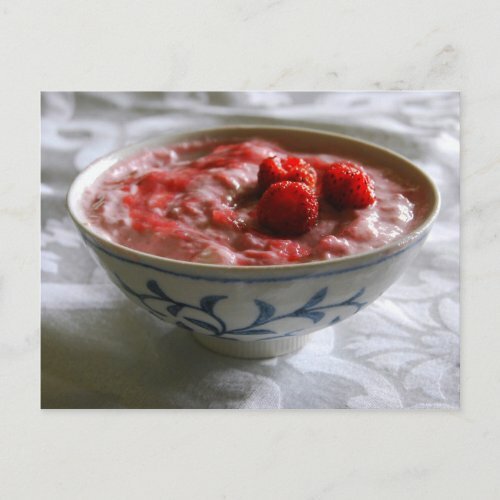 I chopped the rhubarb, cooked it in about two cups water, cooled it and then added a cup of fresh strawberries. Then I added some fake sugar to taste. I added some of the sauce to nonfat Greek yogurt. Yummy! National Cancer Institute Chart. Check yourself and your loved ones for signs of cancer. It’s Valentine’s Day as I write this. What better time to check your loved one for skin cancer? One in five Americans will get some form of skin cancer in their lifetime, and this is probably true for many other countries, as well. Even more Australians will get skin cancer than in the U.S. Although lighter-skinned people are more at risk, people with dark skin also get skin cancer and should also take precautions and check themselves and others. In recent years, several of my family members have gotten skin cancer, including basal cell, squamous cell and melanoma. Although there is a genetic component, overexposure to the sun and repeated sunburns greatly add to the risk. Even in winter, avoid overexposure to the sun and wear sunblock. Stay away from tanning beds. 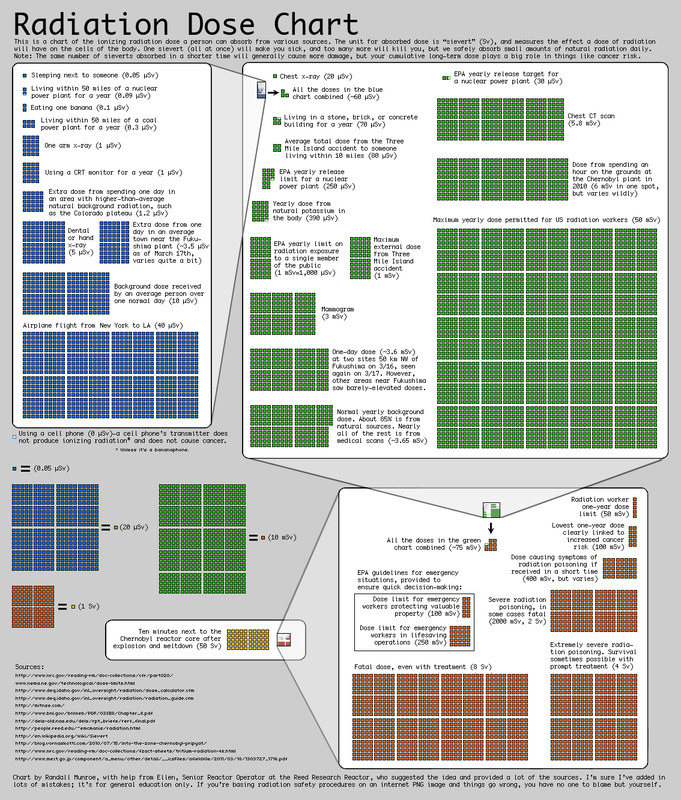 From Wikipedia: There are a variety of different skin cancer symptoms. These include changes in the skin that do not heal, ulcering in the skin, discolored skin, and changes in existing moles, such as jagged edges to the mole and enlargement of the mole. Basal cell carcinoma usually looks like a raised, smooth, pearly bump on the sun-exposed skin of the head, neck or shoulders. Sometimes small blood vessels can be seen within the tumor. Crusting and bleeding in the center of the tumor frequently develops. It is often mistaken for a sore that does not heal. This form of skin cancer is the least deadly and with proper treatment can be completely eliminated, often without scarring. Squamous cell carcinoma is commonly a red, scaling, thickened patch on sun-exposed skin. Ulceration and bleeding may occur. When SCC is not treated, it may develop into a large mass. Squamous cell is the second most common skin cancer. It is dangerous, but not nearly as dangerous as a melanoma. Most melanomas are brown to black looking lesions. 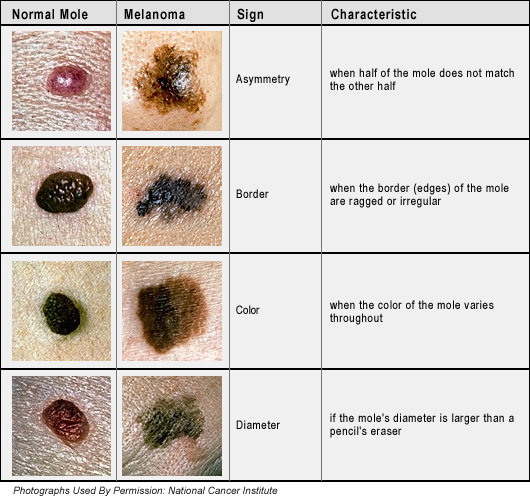 Warning signs that might indicate a malignant melanoma include change in size, shape, color or elevation of a mole. Other signs are the appearance of a new mole during adulthood or new pain, itching, ulceration or bleeding. Merkel cell carcinomas are most often rapidly growing, non-tender red, purple or skin colored bumps that are not painful or itchy. They may be mistaken for a cyst or other type of cancer. About skin cancer. A related post I wrote after I was diagnosed with basal cell cancer. Vitamin D — The Sunshine Vitamin. National Cancer Institute Information on Skin Cancer. Here’s a blog post by my friend Jan describing our spring break trip in college to Padre Island, where we got horribly sunburned within hours of our arrival! Done With The Sun. In one of the most significant breakthroughs in the recent history of ALS research, a consortium of scientists organized and funded by The ALS Association has discovered a new gene, ALS6 (Fused in Sarcoma), responsible for about 5 percent of the cases of inherited ALS.The discovery will provide important clues to the causes of inherited ALS, which accounts for 10 percent of all cases, and sporadic ALS, which occurs in individuals with no family history of the disease and accounts for the other 90 percent of cases diagnosed. “This is a momentous discovery in furthering our understanding of ALS,” said Lucie Bruijn, Ph.D., senior vice president of Research and Development at The ALS Association. “A new gene provides a new piece of the puzzle we can use to shed light on why ALS develops, and where to focus our efforts on creating new treatments and finding a cure.”The results of this groundbreaking research are published in the Friday, February 27 issue of the prestigious journal Science. The project was led by Tom Kwiatkowski M.D., Ph.D., at Massachusetts General Hospital, and Robert Brown, M.D., of the University of Massachusetts School of Medicine, and ALS Association-funded researchers Caroline Vance, Ph.D., and Christopher Shaw, M.D., of Kings College in London.The project was supported by a consortium of leading ALS researchers from around the world, formed as part of The Association’s Gene Identification Project. Their success reflects an unprecedented effort to accelerate the search for genetic mutations linked to all forms of ALS. The gene mutations were first identified by Dr. Kwiatkowski and were immediately confirmed by Dr. Vance, who also demonstrated abnormal accumulations of the mutant protein in cells cultured in the laboratory and the motor neurons of people carrying FUS mutations. The gene, called FUS (“fused in sarcoma”), normally carries out multiple functions within motor neurons. These include regulating how gene messages (called messenger RNAs) are created, modified, and transported in order to build proteins. Some of these same functions also are performed by another gene called TARDPB encoding the protein TDP43, and mutations in the TDP-43 gene were recently linked to ALS as well. The mutations in the ALS6 gene were identified by detailed genetic sequencing in several families with an inherited form of ALS (familial ALS). Normally, the ALS6 protein works in the cell’s nucleus, but the mutations caused it to instead cluster outside the nucleus. Further work will be needed to determine precisely how this leads to ALS. With the gene in hand, scientists will be able to create cell and animal models containing the mutated gene, to examine in detail how the mutation operates and how it causes ALS. “This suggests there may be a common mechanism underlying motor neuron degeneration,” according to Dr. Shaw. Motor neurons are nerve cells in the brain and spinal cord that control muscles. Motor neurons degenerate in ALS. This is the second ALS-causing gene to be discovered in the past 12 months. SOD1, discovered in 1993, accounts for 20 percent of inherited cases of the disease. Mutations in the TARDP gene account for another four to five percent. The only well-defined causes of ALS are genetic. In both inherited and sporadic ALS, the disease symptoms and pathology are the same. The possibility that ALS may be caused by several factors is the rationale for The Association’s policy of funding multiple genetic projects around the world and encouraging these leading geneticists to work together and share information to help locate disease-linked genes for faster, more accurate scientific results. By funding research on a global level, The Association helps put together “genetic pieces” of the ALS puzzle. The Sun. It fuels our world. It's essential to life. We need sunlight to make Vitamin D in our bodies, but the sun's radiation can also cause skin cancer. The challenge is find the right balance of sun exposure and sun protection. Avoid the sun. Wear sunblock. That’s my summer mantra. Now that I’ve had some skin cancer removed, I’m even more paranoid about sun exposure. The darkest time of the year is here, so you’d think I could relax about sun exposure as I enter my annual winter hermit state, covered up and shivering by the hearth. But no, I have a new worry: I actually have to get outside to get some sunshine to make Vitamin D.
Ten to 15 minutes of sunshine (ultraviolet B radiation) three times a week is supposed to be enough for most people, but this is tough in the winter when we’re swathed in fleece. I don’t even like to walk to the mailbox at the end of my driveway when it’s cold. Researchers are continually finding out more about the importance of Vitamin D, including that we probably need more than previously thought and that it’s even more essential to maintaining good health than we’ve realized. Vitamin D could play a role in the prevention of colon, prostate and breast cancers, for example. The amounts in our bodies might affect our mood and our weight. Vitamin D really could be essential to a sunny disposition and important in keeping us from piling on the pounds. Bottom line: Find out how much Vitamin D you need and get a little sunshine at least every other day. The following information can get a little tedious, but it’s important, so pay attention. Vitamin D isn’t naturally present in most foods, although it’s added to milk and cereal. It’s in fish, such as salmon and tuna, in egg yolks and in cheese. It’s also in cod liver oil, which is why we heard stories of a spoonful of it being forced on children in the past. There’s also a danger of getting too much, which can cause increased kidney stones, nausea and mental confusion. Vitamin D is stored in the fat, so if you take excessive amounts it’s difficult to get rid of. We have to find a balance in protecting our skin from sun damage with the need for sunlight to synthesize Vitamin D. The darker your skin, the more sunlight you need to make Vitamin D. One of my biology professors suggested that Vitamin D is so important that it’s probably the main reason for differences in skin color. The closer you to to the poles, the more difficult it is to get enough sunlight to make Vitamin D. Conversely, darker skin protects against sun damage. People with higher skin melanin (pigment) content require more time in sunlight to produce the same amount of vitamin D as do people with lower melanin content. As noted below, the amount of time a person requires to produce a given amount of Vitamin D may also depend upon the person’s distance from the equator and on the season of the year. These people have the right idea. Get outside in the winter, even if it's cloudy and snowy. Just don't get frostbitten or sunburned. I need to take my own advice, because I don't even like to go to the mailbox when it's cold. Latitude and altitude determine the intensity of UV light. UV-B is stronger at higher altitudes. Latitudes higher than 30° (both north and south) have insufficient UV-B sunlight two to six months of the year, even at midday, according to researchers. Latitudes higher than 40° have insufficient sunlight to achieve optimum levels of D during six to eight months of the year. 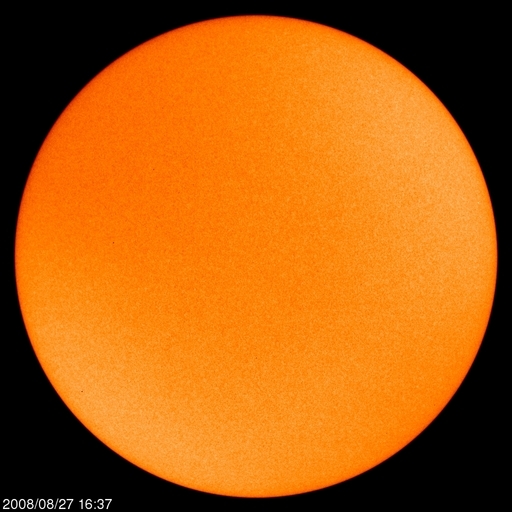 In much of the United States, which is between 30° and 45° latitude, six months or more during each year have insufficient UV-B sunlight to produce optimal D levels. In far northern or southern locations, latitudes 45° and higher, even summer sun is too weak to provide optimum levels of vitamin D. A simple meter is available to determine UV-B levels where you live. Coffee is good for you! At least that jolt you feel won’t harm you too much, if you don’t overdo it. So don’t feel guilty sharing a cup with your friends. Maybe I’m exaggerating a bit by saying coffee is a miracle drink, but it sure feels that way in the morning when I brew my first batch. I have a cheap cappuccino maker, which barely sputters the milk into foam. But who cares about foam? The important thing is that the coffee elixir is saturated with caffeine. All of my muscles come alive as I sip. I feel the energy flowing through my veins. One of the best things about making coffee is the empty can. 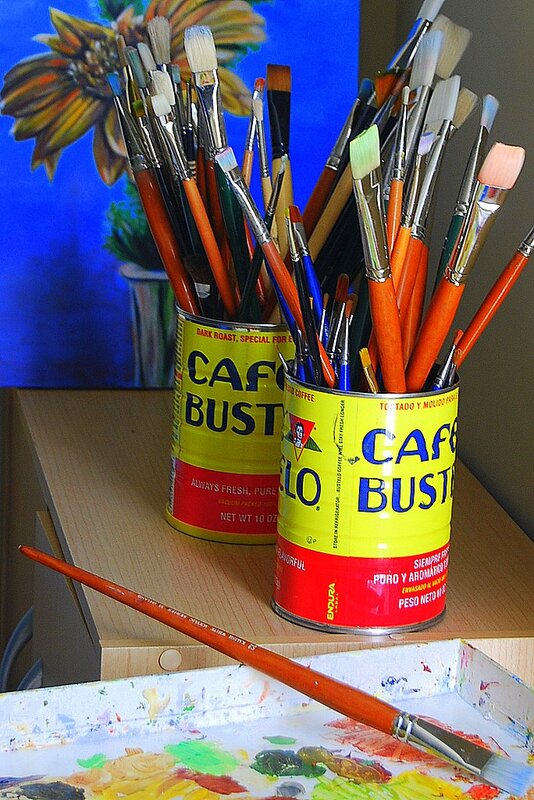 I order my coffee in bags now, but I’ve saved plenty of cans to use to store my brushes. We’ve had a lot of scares about coffee and caffeine throughout the years. Doctors have warned me to stop drinking coffee because the caffeine worsened fibrocystic disease, for example. Sometimes I’ve sworn it off, because I get caffeine withdrawal headaches. But I always come right back to my old lover, warts and all. I didn’t drink coffee until I was out of college (back in the 1970s, if you must know.) I also rarely drank tea or colas. Diet colas in those days were awful. I rarely even ate chocolate, if you can believe that. So I wasn’t getting much, if any, caffeine. I didn’t know what I was missing. Some friends recognized the value of caffeine much earlier than I did. Jan stayed up late into the night, fueled on Coke and sugar cookie dough, to finish art and sewing projects. Some people took their caffeine in pill form. No-Doze was popular right before finals. Finally, coffee just clicked with me. People had tried to get me interested before. “Hey, little girl, want some coffee?” But I always resisted. We all have our breaking point. On a nonstop drive from Lawrence, Kansas, to visit Jan in Berkeley, California, my friend Kathy and I (click here to jump to a previous adventure with Kathy) made a pit stop in Salt Lake City. That city is NOT a mecca of caffeine consumption, but I needed some artificial energy to keep driving. I grabbed a cup of coffee at a diner. Even I, the coffee virgin, knew it was swill, but I was hooked. Perhaps, it was inevitable. Most Americans drink coffee. My father used to joke that his father liked his coffee so thick you could float a spoon in it, and my father had a pot brewing all day long. My son Matt mastered the fine art of brewing espresso. Still, there are coffee abstainers even in my own family. 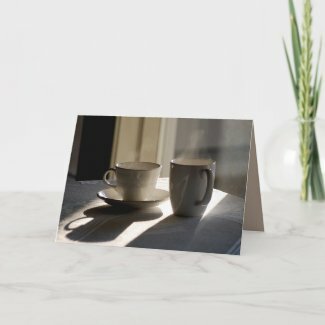 If you want to read all about coffee, go to www.answers.com and ask the right questions. 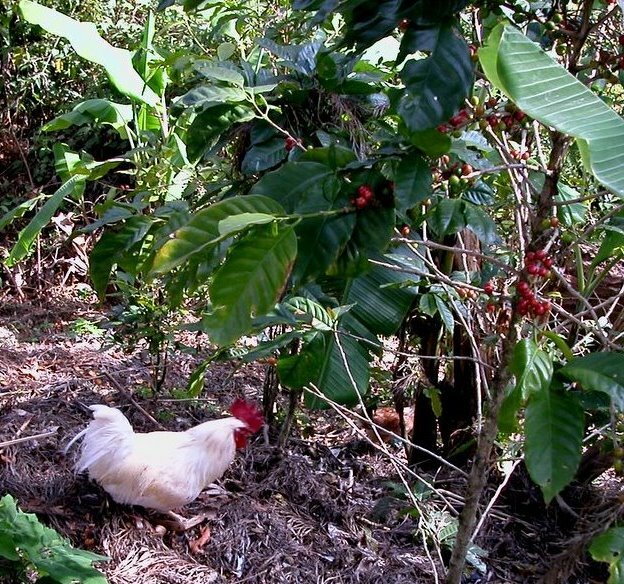 And don’t leave this post until you check out my photograph below of a chicken under a coffee tree. This chicken scratches for dinner under coffee and banana trees near Le Tigre National Park in Honduras. The red cherry covering the coffee bean is edible. I tried one. It was slightly sweet. Tropical highlands are ideal for growing coffee. Perhaps, the land would find a better use if we all weren’t so addicted to coffee.